The Canadian Society of Civil Engineers was formed in 1887. The first members were Thomas Keefer, Casimir Gzowksi, and other civil engineers. By 1918, the Society's members included other disciplines so the name was changed to the Engineering Institute of Canada (EIC). In 1970 the EIC took steps toward becoming a federation of learned engineering societies and the Canadian Society for Mechanical Engineering, the first constituent within the EIC, was formed. The Canadian Geotechnical Society, the Canadian Society for Civil Engineering, the Canadian Society for Electrical Engineering, and the Canadian Society for Engineering Management followed. On August 27, 1985, the CSCE became incorporated. Student chapters of the CSCE have been established in Canadian universities and colleges which offer a civil engineering program. Student chapters offer undergraduate technical programs, often in conjunction with local CSCE sections, and opportunities to meet with practising civil engineers in the community. The CSCE Concordia promotes civil engineering by informing the student body of upcoming competitions and conferences. The Canadian Society for Civil Engineering - Concordia Student Chapter has been the host of an annual bridge-building competition since 1984. Source: Canadian Society for Civil Engineering Web site. The fonds provide information on activities of the Concordia Chapter. 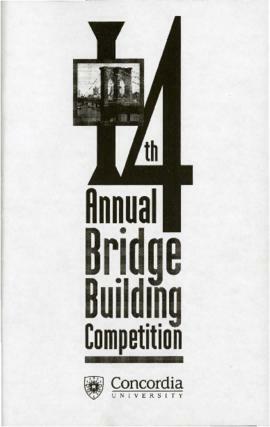 The fonds consists of the programs for the 14th and 15th Annual Bridge-Building Competition and the results from the 14th competition.